This entry was posted on Friday, November 27th, 2009 at 10:25 pm	and is filed under Apples and Cider, Cakes, Pies, and Pastry, Cranberries. You can follow any responses to this entry through the RSS 2.0 feed. You can leave a response, or trackback from your own site. I LOVED everything about Thanksgiving with you; people, pie, asparagus casserole, headband with jaunty angle, all included. I’m looking forward to the apple cranberry crumble (inviting myself again!). Right back at you–except we have to publish YOUR butterscotch-pudding recipe long before next year! Everyone loves pie. 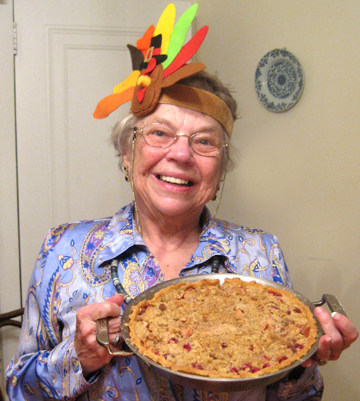 Studies show that nine out of ten Thanksgiving photos on Facebook feature pie. Since my FB friend Tom pointed that out, I’ve noticed it’s true! Oh my, that sounds good! Sounds like you all had a great day! 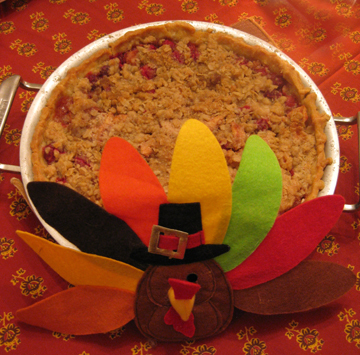 I made a cherry-apple crumble the other night… yum! (didn’t feel like making another piecrust) How did the Cranberry Cream Puffs come out? The cream puffs were absolutely TO DIE FOR! Coming soon to a blog near you. Love the sound of your crumble. Just reading those recipes and looking at the pictures got my mouth watering. You have MY vote! And I love the photos of you, your Mom and your Aunt Lura! Made an apple cranberry cumble pie last night — but you know me, I just have to fiddle with the ingredients! 1/4 cup of dried cranberries and the additions to crumb topping included 1/4 cup biscuit mix plus half crushed Honey Bunches of Oats cereal instead of all oatmeal. Whoa, did my fam LOVE it! Thanks for the great idea.